“Methi’ or ‘Fenugreek’ is full of iron, vitamins and minerals, but its bitterness makes it ‘hated’ vegetable amongst children and adults too. So I try out recipes wherein they won’t come to know, methi is used. Paneer or cottage cheese is liked by almost everyone. So I thought of combining the most favorite vegetable with the least favorite one. I did that and the result was splendid. A failry simple recipe which is ready in minutes and tastes awesome. I guarantee! 2 tbsp cream to garnish. Heat oil in a pan. Add cumin seeds, ginger, garlic, green chillies and onion and saute until onions become soft (on low-medium flame). Then add methi leaves and saute them stirring continously for 5-7 minutes. Now add red chilli, turmeric and coriander powder and mix well. 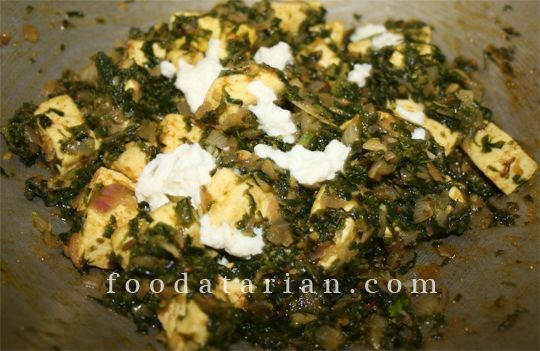 Cook for a while before you add the paneer. Season with salt and stir well. Cook for 4-5 minutes. Later garnish with cream. Serve with parathas or butter naan. * Some people do not like the bitterness of the vegetable. To remove some bitterness, after chopping methi, add generous amount of salt to it, toss and leave it for a while. Later press the leaves in between your palms and remove all the salt water from them. Use these drained leaves. This helps remove bitterness. While I do not prefer this since, a lot of nutrients are lost in this process, so you gain nothing by eating the vegetable.